"How has your experience affected you? What has it done to you emotionally, mentally, physically, spiritually, etc.? What has your journey been like? How have you gotten where you are today? Do you feel you’ve healed? What do you still struggle with?" Good questions. Let's see- how has my experience affected me? It's literally affected every area of my life. Obviously abuse is never a good thing, and there have been many struggles along the road to healing, but I'm proud to say that I've fought like hell and come out so much better and stronger. I'm a fighter, a survivor, and I'm proud of how far I've come. So- physically. One thing I've learned through all of this is just how interconnected body, soul, and spirit are. When I first started becoming aware of the abuse, my health took an absolute nosedive. I went from being a relatively healthy person with no concerns to someone with serious health issues in a matter of months. My main issues were digestive, and while I'm a little embarrassed to go into all the details, just imagine the worst things you can imagine about IBS, and that's what I was dealing with. I eventually figured out that I'm allergic to gluten, and my health improved somewhat after eliminating that from my diet, and then improved significantly again after a year on the GAPS diet and a parasite cleanse. The really interesting thing though is that I never had digestive problems before becoming aware of the abuse and before I started the extraordinarily stressful process of working through all of that. I do think that I'm legitimately allergic to gluten, but I also fully believe that my health issues were directly related to the stress of these experiences. Emotionally. While going through all of it, my emotions were all over the place. Depression, anxiety, panic attacks, suicidal thoughts, the whole 9 yards. As my sister pointed out after reading Monday's post, I also had some reactions that weren't unlike PTSD. I was a mess. I felt like I was going insane. I knew I wasn't crazy, but goodness, it sure felt like it some days. I had such little control over my emotions, and the depression was so constant and so crushing. Again, some of this was definitely exacerbated by the gluten and gut issues, but a lot of it was a legitimate emotional reaction to what I had been through and what I was going through processing it all(and the subsequent effect on my marriage). But now? It's like night and day. Now I've found healing, now I've learned to set healthy boundaries and learned what it means to love myself. After learning how to love and accept myself, my heart has been opened to love others, to truly love others for the first time in my life. That nagging feeling that I wasn't really living my own life is gone. I feel freedom, hope, and joy. Yes, there are bad days and even rough seasons. But I know now that not only can I get through them, but HOW to get through them. Mentally. I've learned that I'm strong. That I'm relentless. That I can get through just about anything. I've learned that I'm intelligent, that I'm not cut out to be a full time stay-at-home-mom(and that's okay! ), and that I still love learning. I've learned that it's okay to think for myself. I basically had to start completely over, figuring out what *I* actually think and believe, and while that's a strange process to start so late in life, it's also been so much fun. Spiritually. Like I described earlier this week, at my lowest point I couldn't even open the Bible, dreaded sitting through church services, and could hardly pray. To have so much trust shattered- to find your life in shambles because of what you'd been taught in the name of God- was just totally devastating. I honestly didn't even know where to begin, but for the first time in my life I decided to be honest with myself about how I was feeling. I gave myself permission to not want to open the Bible. I figured God would rather have me not open it out of an honest heart than to keep reading it out of obligation like I'd done for the past 15 years or so. I just didn't want to be fake anymore. I stopped opening the Bible unless I really wanted to. I didn't do anything spiritual unless I actually wanted to. It was so dark. And yet God can be found in the darkness too, especially when there's an honest heart there. I found Him speaking to me, undeniably speaking to me. Still, even when I couldn't speak to Him, couldn't put any effort into it anymore, even when I was so hurt and so tired and so done, He still pursued me. It's been a long road, and I don't think I could even explain how, but He showed me grace and love. For the first time EVER, which is a complete and utter shame considering I grew up in CHURCH, I started to understand what grace and love look like. It's awakened and affected every part of me, every relationship that I have. I've learned to show grace to my children and my husband. I'm learning how to show grace to myself. My spiritual walk is deeper and more real than it ever has been. I feel like I've healed a lot, although this process of starting to share my story and reevaluate it has shown me that I still have a lot more healing to do. One thing I'm struggling with right now is that after so many years of trauma and going through absolute hell, I still find myself looking around every corner, expecting something horrible to happen. Sometimes, if things have been peaceful for too long, I'll find myself trying to pick a fight with Thad or subconsciously looking for a situation to be angsty about. This is obviously not healthy. I also struggle with knowing that we live in a world where patriarchy is alive and well, where gender hierarchy is the norm both inside and outside the church(but especially inside), and where women are abused every day in the name of God. I'm still trying to figure out what part I can play in helping that stop, and I think for now, sharing my story here is a good place to start. 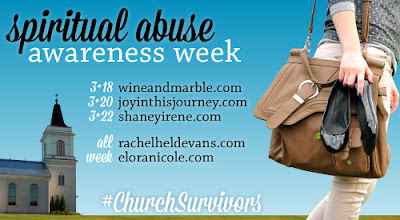 Today I'm linking up with Joy in This Journey for Day 2 of Spiritual Abuse Awareness Week. Click over to her blog to read other stories or to share your own.